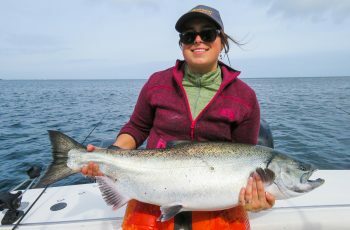 Finally continues to improve up here at Langara, as the weather remains good and the chinook filter in on the west side searching out large herring and needlefish. 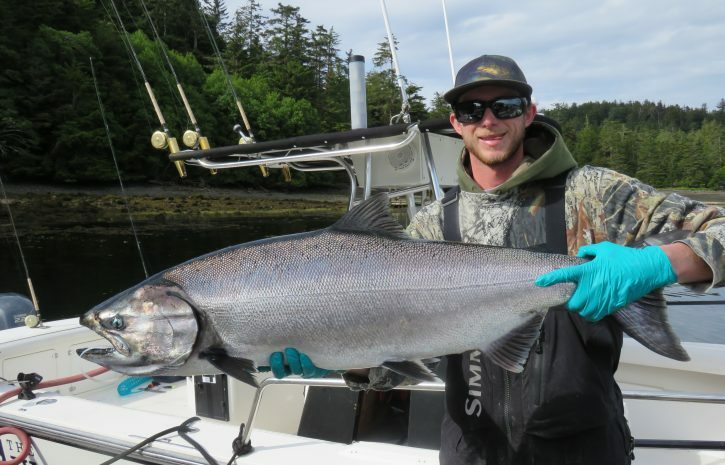 Three tyee to report tonight, and the screamer finally got off the snide. Tim Bell had a 31, I believe from Lacy area and another 30 showed up on the dock. 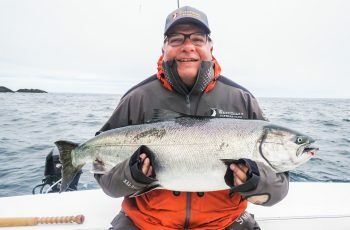 Putting some pressure on myself seemed to work and after about 10 days of wondering what I am doing wrong, a nice 38 lb chinook greeted my boat this am, landed with guests Ivor Jones and Suzette. We hit the fish first pass at the western rock, 60 feet off the rigger on a fresh cut plug herring. The wind is out of the northwest the last couple days, so we had to deal with a 4 foot sea with a chop out there, but once hooked up we never noticed. Lots of donuts spinning around the fish attempting to keep angler squared up to the fish, boat off the rocks and the seas out of the boat, lots of fun. After about 15 min. we had the fish bagged, fatally hooked by the gill arch, blood pouring out of the fish, measuring 43 by 26 and weighing in at 38 lbs. Nothing happened for about two hours more when a huge pile of bait poured in on the tide and settled in mutton bay. Jordie hit a triple and I followed hitting two triples in a row of teeners, soon Kory on my tail, and Kui, all our wagons poured in and got on the gravy train, corking each other and potting each other down, a fish bonanza, first of the year. Reels screaming, wagons spinning, all guests in the area had fish corked on the mooching rods. We had a good school scoped out and punished them accordingly, a lot of happy guides finally getting some easy ones! After lunch the fish moved off to Cape Knox, not my fishery. The guides that went over grabbed some more,boat 17 sat on bait balls for several hours grabbing 5 fish to 27 lbs. Mostly teeners again though. 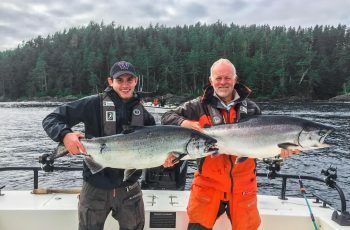 Our halibut charters, the two PREDATOR boats scored big on the offshore anchor program, with each guest limiting on fish to a hundred lbs, Pat found some nice 25,s, ideal for the kitchen table. I’ll be there the end of AUG . to flyfish for silvers w/ Bob Mc Donald……….fish on!!!! 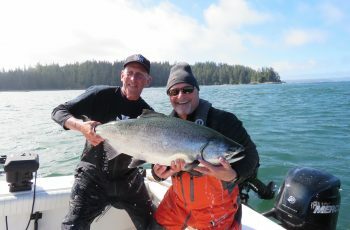 My husband Jerry Houle is out there fishing with you right now ! 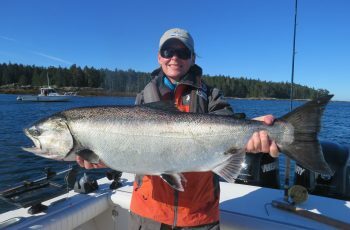 It’s great to read your daily fishing reports to see how the fish are biting !! Good fishing to all !